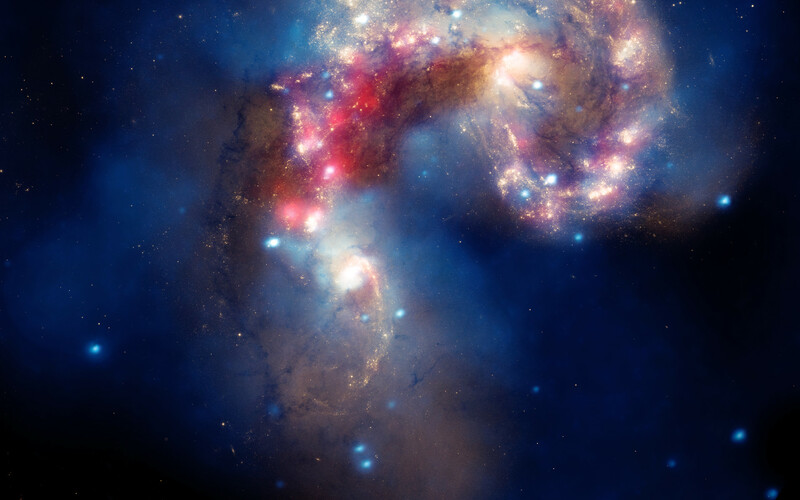 A beautiful new image of two colliding galaxies has been released by NASA's Great Observatories. 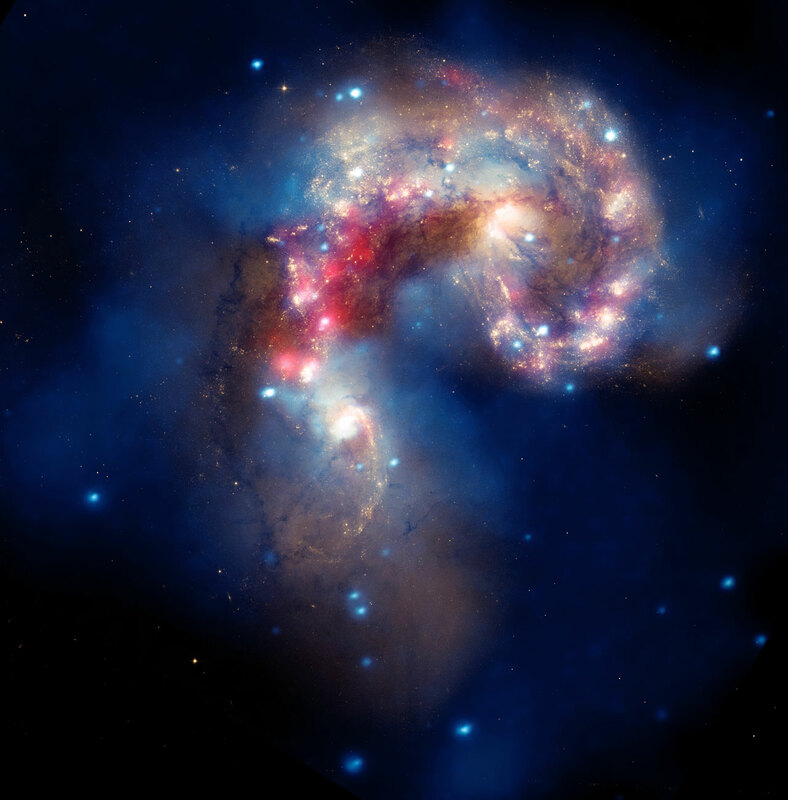 The Antennae galaxies, located about 62 million light-years from Earth, are shown in this composite image from the Chandra X-ray Observatory (blue), the Hubble Space Telescope (gold and brown), and the Spitzer Space Telescope (red). The Antennae galaxies take their name from the long antenna-like "arms," seen in wide-angle views of the system. These features were produced by tidal forces generated in the collision. The collision, which began more than 100 million years ago and is still occurring, has triggered the formation of millions of stars in clouds of dusts and gas in the galaxies. The most massive of these young stars have already sped through their evolution in a few million years and exploded as supernovae. The X-ray image from Chandra shows huge clouds of hot, interstellar gas that have been injected with rich deposits of elements from supernova explosions. This enriched gas, which includes elements such as oxygen, iron, magnesium, and silicon, will be incorporated into new generations of stars and planets. The bright, point-like sources in the image are produced by material falling onto black holes and neutron stars that are remnants of the massive stars. Some of these black holes may have masses that are almost one hundred times that of the Sun. The Spitzer data show infrared light from warm dust clouds that have been heated by newborn stars, with the brightest clouds lying in the overlapping region between the two galaxies. The Hubble data reveal old stars and star-forming regions in gold and white, while filaments of dust appear in brown. Many of the fainter objects in the optical image are clusters containing thousands of stars. 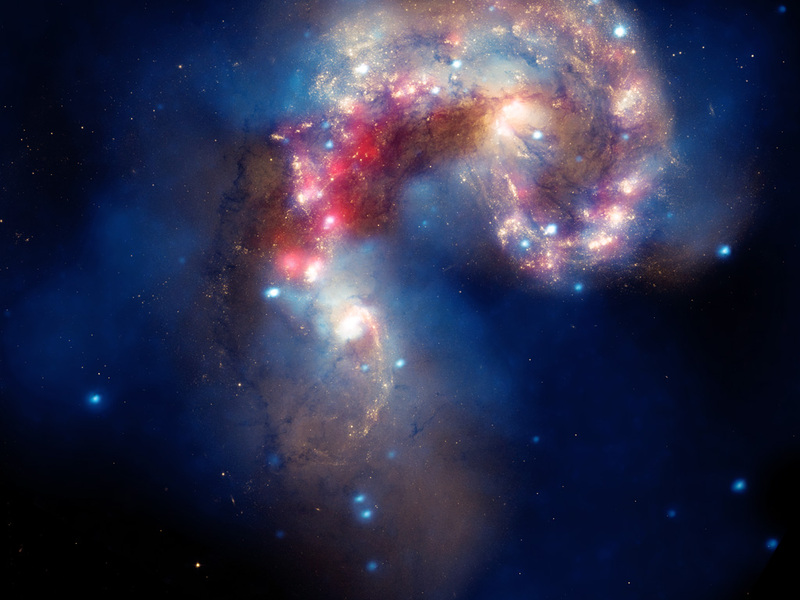 The Chandra image was taken in December 1999. The Spitzer image was taken in December 2003. The Hubble image was taken in July 2004, and February 2005. Position (Dec): -18° 52' 58.60"